The music legend has posted banns at Marylebone Register Office, the location of his low key wedding in 1969 which left Beatles fans around the world heartbroken. 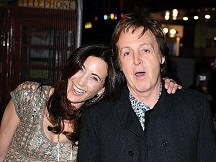 Sir Paul, 69, became engaged to wealthy heiress Nancy Shevell earlier this year. Couples are required to give 16 days notice of marriage, which means they could marry from next month. According to the document, the New York socialite began living at his home in St John's Wood earlier this month. Millionaire musician Sir Paul lost his first wife Linda in 1998 when she died of cancer. He went on to marry former model Heather Mills, a union which ended with an acrimonious courtroom battle when they divorced in 2008. Sir Paul was recently seen out celebrating the 40th birthday of his fashion designer daughter Stella. The document lodged at the venue - officially known as Westminster Register Office - lists the musician under his full name James Paul McCartney and describes him as a "business executive". Sir Paul's daughter Mary also used Marylebone as the venue for her wedding last year. A spokesman for the former Beatles star would not comment about the wedding.